Book a trip to Gili Islands and you’ll get to experience the magic of one of Indonesia’s up-and-coming tropical getaways. With its bright azure waters, palm-lined beaches and premium resorts, holidays in Gili Islands are not to be missed by any holiday maker who is looking to bask in the full splendor of Indonesia’s lush coastline. Gili Trawangan is the island where the party never stops. The largest of the Gili trio, Trawangan boasts miles of pristine sand, a plethora of dining option and sea-facing bars where music doesn’t stop until the early hours of the morning. Gili Air, the second largest island of the three, is a little more laid-back compared to Trawangan. Here, you can unwind amidst coconut groves or go exploring the area’s colorful aquatic life. Home to just over 400 people, Gili Meno is the tiniest island in this mini-archipelago. Due to its peaceful atmosphere, it is the ideal destination for travelers who would like to relax away from all signs of civilization. Turtle Sanctuary in Gili Meno is one of the prime spots for animal enthusiasts. At this privately-run conservation hub, you might get the chance to release baby turtles into the sea. Since Gili Islands aren’t serviced with an airport, the closest place to fly into is Lombok International Airport on the island of the same name. The islands can then be reached by boat from Bangsal. Alternatively, if arriving from Bali, you can get to Gili Islands via speedboats, which are run by a number of local services and tourist agencies. 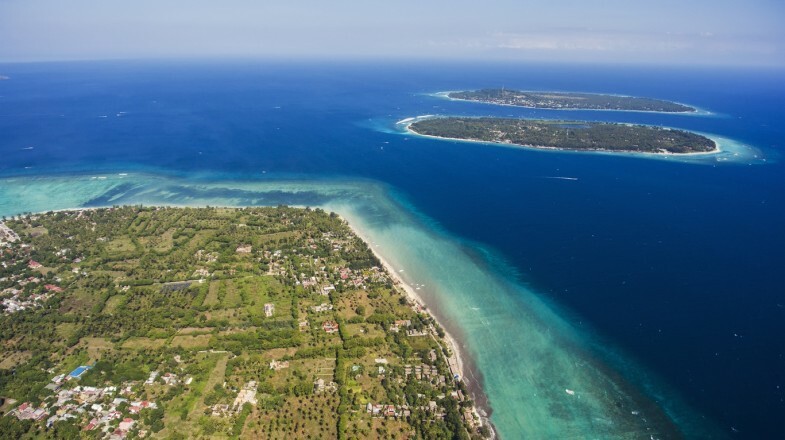 The best (and driest) time to visit the Gili Islands runs from July to August and from December to January. Even though it may seem the islands are not that far apart, do not try to swim from one to the other. The currents which run in the channels can get very strong and dangerous. Plus, there are plenty of cheap local boat services that can get you across.